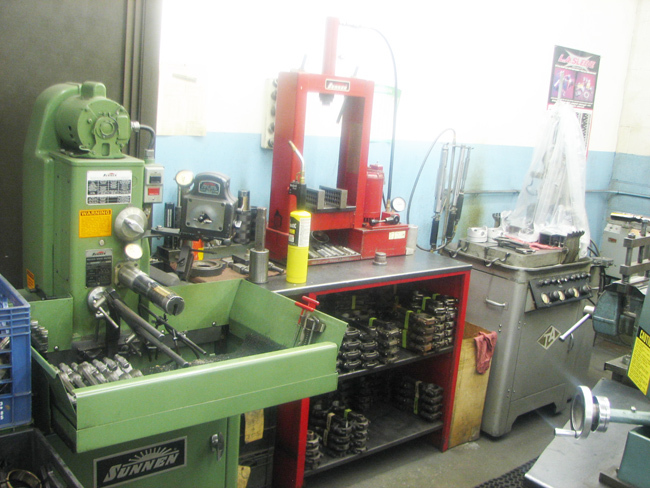 Rod Resizing - Bolt Replacement- Center to Center Bushing and Sizing. The connecting rod of an engine is one of the most abused and least respected parts. The load and stress it experiences are extreme. For example, the connecting rod must support four to five tons of pressure during combustion. Also, the rod is required to reverse its travel many times a second. 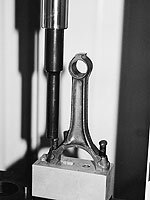 As an example, a connecting rod in the average engine running at 3,000 rpm is reversed 100 times in one second. Much of this load is applied to the bolts that hold the rod to the journal. For this reason, new high-quality connecting rod bolts should be installed during any performance rebuild. The first step is to press out the old bolts, as seen in this photo. A connecting rod that originally used press-fit wrist pins can be honed and equipped with a bronze bushing to accept full-floating pins, which are common in performance aftermarket racing pistons. The rod hone is used to size the small end of the rod to accept the bushing. Floating pins reduce both internal engine friction and reduce the natural twisting and bending loads experienced during combustion.